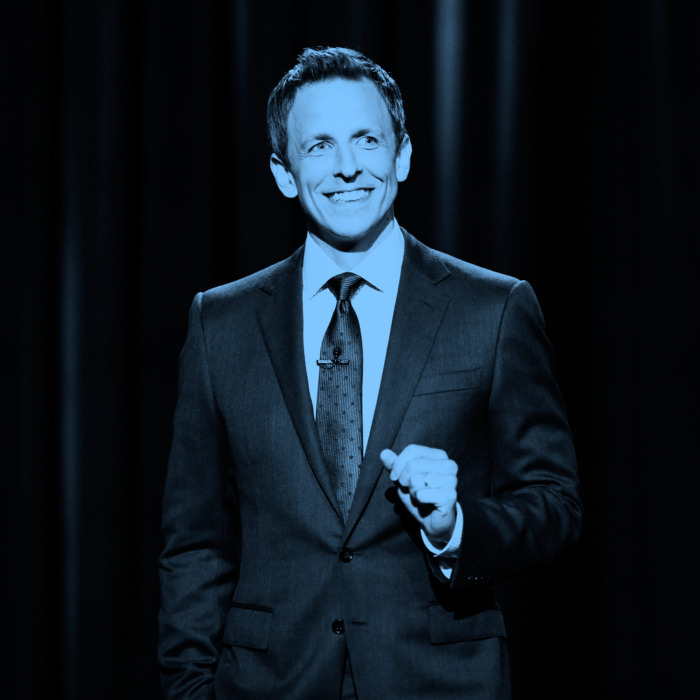 Six months ago this Sunday, Seth Meyers started as the host of Late Night. Taking over for Jimmy Fallon, he purposefully sacrificed Fallon’s viral bombast for a more minor comedy show. Instead of large-scale parodies and games, Meyers shares a story from his life, queues Fred Armisen up to just riff on something stupid for two minutes, and actually works at getting good interviews out of his guests. The result feels like a late-night show that could have worked as well 40 years ago as it does today. Vulture sat down with Meyers, who is also hosting the Emmys next Monday, to talk about his first half-year as a late night host, award shows, and Saturday Night Live. I was listening to your Nerdist podcast from a couple years back and you said your biggest fear was that whatever you did after Saturday Night Live would feel boring in comparison. So, how’s it going? [Laughs] It’s not boring! But it is a better job for the place I am in my life. I mean technically it’s more boring than SNL, but it’s great for a 40-year-old man who’s married and also wants to get home before, you know, one in the morning. But it has completely filled the gap. I think that if I looked back and had to redo that interview, my biggest fear would be that I wouldn’t be surrounded by a writing staff. That was my favorite thing about SNL – just how many funny people you got to work with. The fact that we got to put together a staff here of like-minded, really funny people has made the transition easier, because I think if I left SNL and hadn’t landed at a place that had people like that, I would feel very alone and sad right now. Have you skipped any tapings of SNL yet? The only one I went to was the season finale, yeah. Poehler warned me that going to SNL when you have nothing to do is much like being a ghost at your own funeral. It’s all very familiar, but at the same time you can find no purchase in that plane of the workers. So, yeah, I only went back one time. But I haven’t missed an episode. Has it been weird to watch? The first one was incredibly weird. Especially, it was really weird to rediscover something that I had known as a teenager, which is, there are so many commercials. I was both having this emotional breakdown of not knowing what the next sketch would be and not knowing who wrote it and how it came together, but also a real budding frustration with how many commercials there are. So, with Late Night, what’s been easier than expected and what’s been harder? It’s been easier to interview people than I thought it would be. I just was irrationally afraid of that because it was the one skill set that was furthest away from anything we ever did at SNL. When you interview fictional people it’s a little different. You have an excellent sense of what they’re going to say next. And then, harder is just reminding yourself that, unlike SNL, where I do think that it’s a big deal when it doesn’t go well because you put a whole week into it, I think part of this is when something doesn’t go to the optimal level that you had hoped for, you have to sort of shake it off and know that it’s not SNL, where you walk off and for the rest of it you have to stew in your own juices. Here you have to go, “Okay, we’ll get ’em next time.” So, I had to learn to be a little bit less precious about it. What is a good episode of late-night television to you? The monologue is probably the biggest indicator. I think a good monologue puts you in a good mood for the rest of it. But it is funny because your memory only serves to the last thing you did. If I don’t feel like the monologue went great, but then I go to the desk and we do a piece of comedy there that does work, then you’re sort of like, “We’re fine.” But for us, a really good episode is also dependent on were there good guests? Did you get something out of them? I always want my guests to score. If you have a guest who’s a comedian and they want you to set them up for things, then you have to just set them up for things and get out of the way and don’t put punch lines on their punch lines. And with other people, where it can be an interesting conversation, you want to do the work of watching the source material. At some point, that’s something, when you have kids, you can’t really watch every movie and read every book, but right now I’m trying my best to. How have you dealt with the challenge of shifting from Saturday Night Live, which is meant to be a showcase of wide ranges of comedic perspectives, to this, which is ultimately designed to be a showcase of a specific perspective? I have writers and we did not tell them, “This is my sense of humor, write to it.” We do want them to bring things to the table that I would never come up with. Having Fred on the show is a way to have a completely different sort of comedic voice that is also one that I am a great fan of. I know this is a higher percentage of my voice than it was at SNL, but we also don’t want it to be a show that is just one voice. How much is the show a desire to compliment the bigness and the viralness of Fallon’s show with something more minor and clean? And how much of that is you? Well, it’s always fun to do something that is nothing like anything anyone else has done, whether it’s “Live New Yorker Cartoons” or “Second-Chance Theatre” — those pieces that are both big and small at the same time. We do this giant production to show something that failed or something that is by design really small. I like that this show gives me time to talk about my personal life in a way that would’ve been really indulgent on SNL. I like that we have space for Fred to just improvise for two minutes a night, which is not a thing that has ever been done. I mean, I don’t think Jimmy and [Steve] Higgins worked it out, either, but it’s really fun to just watch somebody like Fred. I become an audience member then, too. But the more things you do, the more you widen your scope. It’s what you realize you can do in a show like this. It’s really late at night, so people are patient in a way that they wouldn’t be in prime time and maybe not even an hour earlier. Earlier this month it came out that James Corden would replace Craig Ferguson. I’m sure he’ll do a wonderful job, but there was a palpable frustration by many people about the relative sameness of late-night hosts. And I know that it’s complicated, and I don’t want you to have to defend why you have a job, but how do you see this situation? Well, it’s strange. Because I would be really happy if a woman got that job. But I’m also really happy for James Corden, who I know to be a really talented and lovely person. It is that tricky thing, which I think everyone has to deal with, which is when the disappointment with the decision-makers can bleed into the person for whom this is also the goal of their career. But with that said I think that people have every right to be disappointed and voice that disappointment. So you are hosting the Emmys soon. How weird is it to be one of the people who are now asked to host award shows? It’s weird. I’ve done some other weird things, which has been helpful. Had I not done the ESPYS, I might not have had the confidence to do the White House Correspondents’ Dinners. At least for me, I haven’t had to take on one of these things before I was ready. But it’s super weird because it’s the first one that I’ve done where the people in the audience are also entertainers. Everything else, even if I bombed, I’d still be funnier than most of the people there. That part of it is terrifying. Also, I know a lot of these people from television, but I also know a lot of them personally. So, here’s the thing: If I see an actor that I know from television respond to one of my jokes, I won’t know what that face means, but if I catch Poehler – I know all of Poehler’s faces, so I’ll be able to read her. But, it’s exciting. I never considered turning it down. How do you make a show like the Emmys your own? I think the same way you make a show like this your own. Again, it’s very strange. Six months after I had to do all these interviews talking about what this show was going to be, now I have to talk about what my Emmys is going to be. The interesting thing about the Emmys is that you talk so much about it beforehand and then nobody asks you questions afterward. No one says, “Why did you do that?” No one even talks about it again until they start talking about the next one and then they can remember back about one year and remember how that one went. But, for me I feel I’m as good as my jokes, so I’m calling in a lot of favors, just people who can help with a really good monologue. That really is half of it, if not more. By definition the host really welcomes you, and then after that you’re really just facilitating. We’ll have one or two other pieces and try to find smaller things to do to transition. But after you introduce the proceedings, the night is taken over by the actual event itself. In a really lovely way for me, there are also a lot of other really funny people who will be presenting and doing their own bits. The burden of entertainment is squarely on me for the first ten minutes and then it gets spread out. Who do you have writing? If they could just give you one joke each. Do you have a hosting role model? I really loved Steve Martin as a host. I love the way he tells jokes. I feel he’s very joke-based, whereas I’m jealous of people who can be both host and showman. Which I am not. No one is ever going to mistake me for a showman. But the good news is I don’t mistake myself for one. That would be very, very bad. I feel like a lot of comedy writers are fans of dumb puns, but anecdotally I think the general public doesn’t totally get the charm. I’ve definitely tweeted enough to realize that. How do you know when a dumb pun will work for a general audience? Well, I think why “Jon Hamm’s John Ham” worked — and again, I teach a class on this at Fordham — was because he was so serious. If it had been a joke about Jon Hamm that he was not a part of, it would’ve been a dumb pun. I think the fact that you can get him involved and in his best Draper-y delivery. We also did the Ham and Buble, and a third one that got cut, which was Jon Hamm’s Ham Radio for Johns. And it was a way for people to communicate with prostitutes. That is a longer walk. It was a longer walk and it was a very long walk from Jon at dress rehearsal over to me, where he gave me a very friendly pat on the back and told me that it was a bridge too far. But it went to dress? It was fun. That one I feel good about. The original tag was something about John Slattery’s John Slattery and it was something about Venetian Blinds. But, if you have to stretch even a little bit for a pun, people are very upset with you. “Darrell’s House” (Part 1, Part 2) was you, too, right? Yeah. I will say, only Zach Galifianakis would be patient enough to listen to you explain how an idea like that was going to work. Now that so many people watch it in Hulu clips, it was a real testament to SNL as a live show. The guy who edited had like twelve minutes. It was fascinating how good of a job he did. He had to build a template basically. Did you have the beats of it mapped from dress? Yeah, but we had to re-edit it. Between dress and show we did make a lot of changes. It was the most like Apollo 13 — or was it Apollo 11? The one where it was like, “We did it!” — because that could’ve been a thing where the tape didn’t render or something. There could’ve been a breakdown there. You never know until you finish. God, what would’ve happened if you didn’t edit it in time? Did you have a backup? We didn’t have a backup plan. And then it would’ve been bad, because it was such a janky sketch without the payoff. Did it start with the idea that you wanted to do this two-part thing? Wow. So at first it was just that “Fix that in post” stuff on its own? Yeah, which was a bad sketch. It was a sketch that I eventually would’ve bailed on. It’s just like a lot of SNL ideas, where you write the first few pages and see what takes hold. It was also something of you being there long enough and being the head writer, so you could be say, “No, this is going to be worth it.” Even if it will make a little less sense for the internet. I’m so glad I watch the show live. Or more often DVR, because who can stay up that late?! My wife and I laugh about how rarely I’m up when my show airs now. I have to wake up and go to work in order to make the show now.